This post is sparked by the TED Talk by Sandra Aamodt: Why Dieting Doesn’t Usually Work. Video is embedded at the end of this musing should you want to listen in too. At the heart of the talk is the fact that the brain, specifically the hypothalamus, acts as a sort of thermostat that signals hunger, energy, and metabolism. Whether you start out thin or fat, when you lose weight, your brain thinks you’re starving. For self-preservation, you will feel hungry and have less energy available. Because I have been morbidly obese in the past 10 years or so, my body and my brain may very well have learned to think that this is the normal. Going down to a ‘healthy’ weight in the obesity scales will definitely not be a walk in the park because I am no longer wired for a lower number on the weighing scale. Realizing that doesn’t give me an excuse to not make an effort. In fact, what she says next only encourages me further to continue with the lifestyle changes I’ve committed to recently. Sandra points out that there are two types of eaters – intuitive eaters: rely on their hunger, and; controlled eaters: rely on willpower. Looks like I’ve been more of the latter. That explains the endless cycle of starving and then binging. Skipping meals and then going on an all-you-can-eat buffet. When I was in highschool, my grandmother was against my going on a diet. She argued that I just need to stick to a healthy three full meals a day. Don’t skip, but don’t over indulge. If I had just listened to her then, I may have a chance to be 30 pounds lighter today. By the way, looking at my highschool photos now, I realize now that I wasn’t FAT! But at the time? Geez. Sandra also talks about mindful eating. Listen to your body and eat when you’re hungry. But listen too when it says that the hunger has been satiated. Now that may take me awhile, so smaller portions will also help. The short story is that the more of the 4 habits you have, the lower risk of death – regardless of weight. 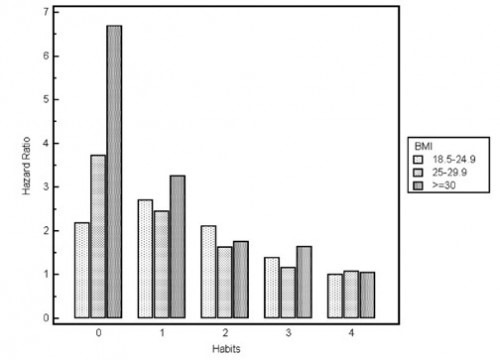 For the obese (darkest shaded bar on the graph), even just one healthy habit significantly reduces the risk by almost 50%. And when all four healthy habits are present? Then weight doesn’t matter. The person with the normal weight is just as likely or less likely to die prematurely than the obese person. So I guess I am on the right track. Except that when I resolved to make a habit of having green smoothies daily I had weight loss in mind. Now, I’m changing my mindset. My goal is no longer to lose weight, but to just be better. I think that can be achieved without necessarily losing all of my excess weight. If I can lose weight while eating more fruits and veggies and adding exercise in my lifestyle, then that’s a bonus. i am thankful to read your post.. very informative..
We share the same goal Vera. I am more focused on having a healthy lifestyle, I know the flab and bulges will eventually disappear once I’m on the right track. I wish it’s that easy for me to lose weight as well… but it’s really hard to minimize carb intake since I love rice. Hehe! But yeah, don’t you just wish we kept the body types we had back in high school? The bulges only started showing up when I started working for a BPO company and eating became my coping up mechanism. Rose´s last [post] ..Watch List: Intelligence, Enlisted and About Time. Is an emotional eater a controlled eater? Ganun ako eh. When I’m stressed, I eat. When I’m happy, I eat. I’m just fortunate that breastfeeding made me even lighter than I was pre-pregnancy. Pero ngayon, I can’t depend on that anymore. I’m starting to make little changes like lessening my food intake. Soon, I should be exercising regularly na rin. Thanks for this informative post, Vera! Starving the body always result in your putting on more weight then necessary to get back to the set point. I agree changing your overall lifestyle is more important then crash dieting and focusing so much on the scale. There are many people obsessed with dieting always resulted into a failure because of some misconceptions. Thanks for sharing this one. I thought I was fat in high school too. My problem naman ata I think is that I get too hungry after working out. some swear losing weight is 90% diet and 10% exercise. I am really not keen about being thin. I just want to be at a healthy level where there is lower risk of health problems. I guess I only have to do two things- eat more veggies and exercise more. Easy to say, hard to do. I watched that video too and my thoughts are that when we think Diet, we think Death to all the fun we have with food. It is really about working to eat just enough and appreciating the food without feeling deprived… easier said than done. Changing ones lifestyle and way of eating really has to do with brainpower.. interesting article.